Frequently, ICE receives requests from churches who are interested in renting space to groups, but they are confused about what to charge to cover energy costs. If you go through the following steps, you will arrive at a rough estimate of the energy cost involved in renting space in your facility. 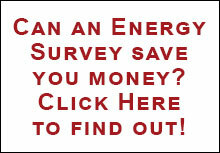 Please bear in the result from following these steps is an estimate of energy cost. lf you can actually measure the consumption for use of the various parts of your facility, those measurements would likely be more accurate than an estimate. We think that it is best to estimate energy costs for rented space in two ways. The first way involves estimates of energy costs for the occasional user. For your protection, it is best to anticipate that these users will want to rent space during the coldest hour in the winter or hottest hour in the summer. The second way involves estimates of energy costs for the regular user, such as a day-care center or Alcoholics Anonymous, that will occupy your facility regularly, every week over a longer period of time. Step 1. What is the heating cost? What space must be heated for the occasional user? Even though the renter may want to use only one room, you may have to heat other rooms in order to provide heat to that one room. Don’t forget to include stairwells, corridors and restrooms. Now think of how the boiler or furnace operates on the coldest day of the year. How long does it operate to heat the amount of space that you will have to heat for the potential user? In other words, determine the number of hours that the unit must run to heat the space and maintain Comfort temperatures on the coldest day during the time that the user wishes to occupy the space. The number of hours of burner operation can differ if the burner cycles on and off, or has high and low firing rates. The hours to count are those when the burner is running continuously. Now, examine the nameplate on the boiler or furnace. It should tell you what the “BTU Input” or ”Nozzle Size” is. If you cannot determine this, your fuel oil dealer or gas utility could tell you this number if you can provide them with the model number of the furnace or boiler. You must know the capacity of the unit in either CCF/hour input (BTU input per hour divided by 100,000} for gas-fired units or in gallons per hour for oil burners. Multiply the capacity by the number of hours that the boiler or furnace must operate to adequately heat the space. This will give you the CCF of natural gas or gallons of oil required. To obtain the heating cost, multiply the gallons or CCP’s by your current cost for oil or gas. For example, assume that you were going to have a two hour wedding in the sanctuary, and it would take another three hours to preheat the room on the coldest day. You look at your boiler, and the nameplate reads “1,500,000 BTU Input”. Divide 1,500,000 by 100,000 and you get 15. This means that the boiler uses 15 CCF each hour that it continuously runs. If you think that it must run continuously for four hours for the wedding, and if you are paying $78 per CCF, your cost would be 15 CCF per hour times 4 hours times $.78 per CCF, or a total of $46.80. Step 2. What is the lighting cost? Lighting cost is easier to estimate. You count the number of each type of light (Floodlights, fluorescent lights, different wattage incandescent bulbs, etc.) that will be used. Then you multiply the number of lights for each type of light bulb by the wattage of each type of bulb. Then, you divide the total wattage by 1000 and multiply this number by the hours that the lights will be used to determine the kilowatthours of electricity to be used. Next, examine one of your recent electric bilis. Divide the total cost paid by the number of kilowatthours used that month. This is your cost per kilowatthour. Lastly, you multiply the number of kilowatthours by the cost per kilowatthour to determine the costs for the lights. In our example of the wedding, you count the lights and find that there are fifty-three 100-watt bulbs and six 150 watt spotlights that must be on during the period. This means that there will be a total of 6,200 watts. You determine from your latest electric bill that you are paying $.13 per kilowatthour. To find the cost for operating the lights, divide 6,200 by 1,000 to get 6.2Kw. Multiply 62 times two hours to get 12.4Kwh. Multiply 12.4Kwh times electric cost of $.13 per Kwh and you find that the lighting cost will be $1.61. Step 3. What is the cooling cost? If the space to be rented is cooled, determine the wattage of each air Conditioner, which you can read from the nameplate on each unit. If the space is cooled by systems larger than window units, ask an electrician to determine the total wattage for the system. Divide the wattage by 1000 and multiply by the number of hours that the window air conditioner(s) must run in Order to cool the space. Don’t forget to add the number of hours needed to precool before the activity begins on the hottest summer day. The resulting number is the kilowatthours of electricity necessary for cooling. Then, multiply the number of watthours by the cost per kilowatthour determined from your electric bill, That is the cost for cooling the space. Step 4. What are the costs for hot water and cooking? If your tenants want to use the kitchen, don’t forget to add the costs for Cooking and heating domestic hot water to the cost of running the kitchen lights. As a rough rule of thumb, add five dollars per hundred persons to cover the costs of heating hot water and cooking. This is equivalent to about 6.5 CCF of natural gas at $.78 per CCF, 39 kilowatthours of electricity at $.13 per kílowatthour, or 4.5 gallons of #2 fuel oil at $1.10 per gallon. Ratchet penalties – According to the general service rate structure for the Philadelphia Electric Company, you will not be billed for less than 40% of the highest peak use of electricity during any 30-minute period between May through October. In other words, if renting your space to a tenant creates :10,000-watt peak use of electricity with air Conditioning, the electric utility will bill yuo for no less than 4,000 watts of peak electric use for the following October through May. Increased electric costs for the next few months may have to he paid by a single user if a high enough peak use of electricity is created by use of air conditioned, rented space during the summer. If your electric service is the high tension or primary distribution type, you will not be billed for less than 80% of the peak summer use. Watch out for the ratchet penalty. Speak to your utility representative if you need further information. Sudden oil cost increases – When you make a deal with a renter, protect yourself by including 3 clause that makes the renter pay more if there are sudden fuel oil cost increases. There is no need for you to absorb these costs. Night Service Rider – Many Churches and synagogues now have night service meters. A renter could cause you to have a peak use of electricity during on-peak hours. This means that the renter should pay your increased electric costs for that month, plus any ratchet penalties for the following months. ICE has records of the use of electricity for a central air conditioning system as measured through a night service meter in a church just north of the City. The Congregation has to spend about $80 per month from October, 1984 through part of May, 1985 even though they will use no electricity. This is a stiff penalty for use during on-peak times. Click to View or Download it by right clicking the link – choose “save as”.